Way to GO! My mom is going to leave ME in 2 weeks. I may do that. I guess this would be a bad time to ax if your Mommy wanted a free pass to Blogpaws, wouldn't it? BTW, we have a cat statue thingy almost just like that. Maybe you should sneak INSIDE the bag, Maxwell. That way, even if they leave, you get to go along! Good idea, we will try that too!! love that photo. My Angel Bobo used to do that all the time! I think you will need to take sleeping shifts with Faraday and Allie, Maxwell - a kitty's gotta eat sometime, you know! Good idea, Maxwell. Does that work in your house? I try it, too, but Mommy and Daddy still have to go on trips sometimes. Maybe I'm not furring it up enough? I'd vote for the peeing too, Maxwell. Belt and braces my boy!!! No one is leaving anytime soon! Sometimes a kitty has to take things into his own paws and just take a stand (or nap). Maybe you should sneak INSIDE the bag, Maxwell. That way, even if they leave, you get to go along! Maxwell - a kitty's gotta eat sometime, you know! That is such a good idea of how to keep those beans at home. 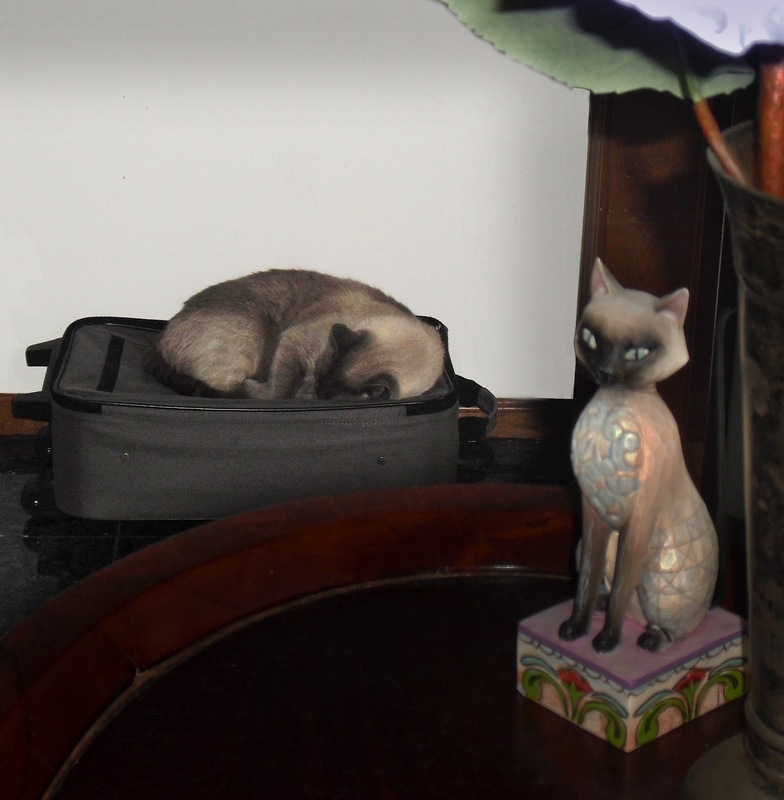 Just sit on that suitcase. Have a great Friday.